The Troy Bumpas Inn’s last guests will have breakfast Sunday morning, and then the longtime b&b will close for good. Owners Judy and Larry Horn will sell the house next week to a couple who will live in it as a home only, not a business. Larry Horn says he and Judy wanted to have more flexibility in their lives, particularly to visit three grandchildren born in the last year and a half in Chicago, Los Angeles and Washington, D.C. They’ve bought a home in the nearby Lake Daniel neighborhood. He says the new owners are moving to Greensboro from out of state and have owned a historic home previously. The house, which is actually known as the Bumpass-Troy House, is a Greensboro landmark, one of three remaining antebellum homes in College Hill. Built in 1847-48, it was originally the home of the Rev. Sidney Bumpass, a trustee of then-new Greensboro College, and his wife, Frances. Daughter Eugenia Bumpass Troy expanded the house in 1911 and began taking in boarders. It remained in the family through Eugenia’s children nieces [see correction in the comment below] until 1975, when it was bequeathed to Greensboro College. The college quickly sold the house, and it endured years of decay as apartments. In 1991, Preservation Greensboro helped save the house from destruction, buying it and placing preservation easements on the property. The easements require consultation with the organization on major renovations, interior and exterior. Those easements remain with the deed in perpetuity. 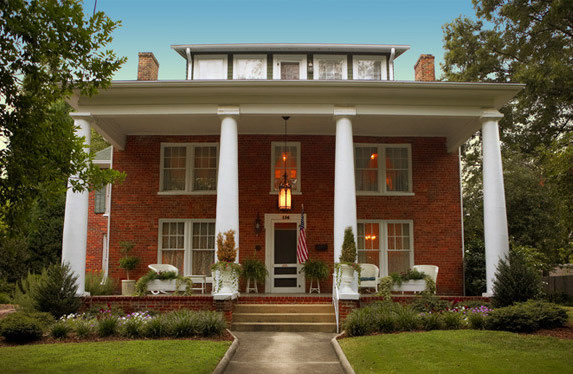 Gwen and Charles Brown bought the house in 1992 and made it into a bed and breakfast. John and Andrea Wimmer bought the house and business in 2004. They sold it to Larry and Judy in 2011. The Bumpass-Troy house was added to the National Register of Historic Places in 1977. It also has been designated a Guilford County landmark property. This entry was posted in Businesses, Mendenhall Street and tagged Troy Bumpas Inn. Bookmark the permalink. I have an important correction, even though this article is a year old. I’m just now seeing it: The house remained in the family through Eugenia’s nieces, not her children. She never married and had no children. The Troy sisters who inherited the house: Allah, Nina, Lota,and Ethel, were the children of her sister, Duella Bumpass Troy. I am certain of this because my doctoral dissertation at UNC-CH in 2005 was about Frances Bumpass. I have been historical consultant to all of the owners of the Troy-Bumpass Inn since Gwen and Charles Brown. Cheryl F. Junk, Ph.D.